Today I am getting an extremely late starting in getting my “morning” blog post out there. At this point it is almost 2pm as I sit down to write this. There are a lot of reasons behind that, in part because video takes a really long time to render. Not to mention the fact that somewhere between streaming and now we also went out and ran errands. Blaugust is alive and kicking and I am still shocked and amazed at the turnout. My wife has even spawned her own version of it within the Math blogosphere without really meaning to. I think it is pretty awesome when the spirit of Blaugust spreads to communities that were not a part of the first year. As of this morning I had eighty four bloggers signed up and tracked on the list I am keeping. I am still trying to catch up on day one honestly because that many blog posts… is an awful lot of reading. This is absolutely an amazing problem to have. If everyone managed to make it through the entire month with a post for every day… that would mean 2604 posts pending we don’t keep picking up more people along the way. This is really the idea is to get out there and get started on creating more content for our community. One of the things that keeps coming up from time to time is how blogging is dead, and I love it when we can prove every single one of those naysayers wrong. There is something magical about putting your thoughts on the page and sharing it with the world. For me personally it is deeply cathartic to share my thoughts and feelings. Over the years I have learned to open up more and share more of myself, and as a result my bonds with my fellow bloggers has gotten stronger. In many ways this community that you are part of is a big support group, because every time I have struggled there has been someone out there to help pull me back to my feet. There has been a thing I have wanted to do for awhile. Some of my favorite Minecraft video series have been adventures with a very simple premise around them. When I play Minecraft however I tend to be a base builder. I craft these extremely intricate underground structures, and never tend to move around much as a result. As a way of combating my instincts, I am going in a completely different direction and starting a series of videos called “Bel’s Big Adventure”. The idea is simple… only keep what I can carry in my inventory and keep moving North. Each time I make camp and reset my spawn point by dragging along a bed, workbench and a furnace. Each day I have to find the resources I will need to make it through to the next day. Today I streamed for roughly two hours, and I am editing these into smaller videos, the first of which is about thirty minutes in length and involves my hitting the first major obstacle… a big ocean. The Minecraft version I am using is 1.8 and I am using the GLSL Shader Mod 1.8 combined with SEUS v10.1 to produce the nifty more realistic appearance. 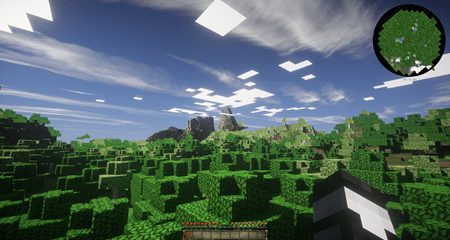 As for the Texture pack I am running Chroma Hills which is known to work fairly well with shader packs. Finally I have the Mapwriter mod running largely to keep me pointed northward, because it shows an Arrow in that direction. Other than these largely cosmetic mods I am using the stock Minecraft 1.8.3 that I freshly installed this morning. It has been well over a year since I last played Minecraft, and as a result there is a lot of stuff in the game that I have not seen yet. For example… I had no clue that there were Bunnies in the game until I came across a black colored one. Similarly in what will likely be in episode two I encountered something bizarre that cursed me so that I couldn’t mine anymore. Most of today has been spent either recording, editing or rendering the video so that I could embed it in today’s post. Hopefully someone will enjoy it, but if not I at least enjoyed the adventure. If I find something really interesting in my journey I might stop and set up a more permanent camp in order to explore better. Since I spent the bulk of my day so far working on this side project, and will likely spend a good chunk more I plan on cutting this post a bit short. Let me know what you think of this idea, and I am also open to other objectives for me to look out for along the way. Oh, Minecraft! Nice idea you got there, going to be fun to watch! Hey Bel, Ted from the Leaflocker here. Noticed you don’t have my twitters on there, it’s @NombreHombre. Cheers.